A miracle star is seen worldwide – have you seen it? For over 30 years author, lecturer and artist Benjamin Creme (chief editor of Share International magazine) has been preparing the way for the emergence of Maitreya, the World Teacher. On 12 December 2008 Share International distributed a news release announcing that in the very near future a large, bright Star would appear in the sky visible throughout the world, night and day. The Star heralds the imminent emergence of Maitreya, who will be giving His first interview on a major US television programme very soon. Since January 2009 hundreds of sightings of the Star have been reported worldwide. Videos of the Star posted on YouTube are creating much debate and Share International is receiving more and more photographs showing the Star in a variety of stunning colours and shapes. In his article from March 2009, Benjamin Creme’s Master reiterates the significance of the Star and seeks to stimulate public discussion about its meaning and purpose. We display a selection of close-up photographs of the Star from various countries. For colour photographs and eye-witness reports visit www.share-international.org. From almost every point of view the situation facing men everywhere grows daily more painful. The economic chaos resulting from years of unlicensed greed and heartless competition lays waste the honest toil and aspiration of countless millions. On the whole, the men of money go blithely on, their treasure intact, while men and women in every country face joblessness, poverty and fear. More accurate readings of climatic changes show men how close this planet is to irreversible calamity, and alarm bells sound loudly on many political fronts, raising to new levels the factor of stress. How much more of this tension can humanity bear? For how long will men accept, mildly, their fate? Desperate men do desperate deeds and already in their minds, if not yet in their actions, many contemplate revolution. Behind the scenes, Maitreya watches carefully these happenings, and gives succour wherever the Law allows. He waits, patiently, for the build-up of response to the sign of His Emergence, the “star-like luminary of brilliant power” on which many now gaze in wonder and even love. What is desired is some measure of public debate about the significance or meaning of the Star, thus signifying the emergence of Maitreya, the World Teacher. The greater and more public the discussion, the greater does it prepare the way for Maitreya’s entry. Soon there will be no gainsaying. Very soon, Venus will move beyond the sight of men and so leave the platform of the heavens open to the Star. Then there will be no doubt that the Star is there for all to see. If sufficient discussion can be fostered on the various media and internet it will not be long until men see and hear Maitreya speak. He will not be so called, that men can judge His ideas rather than His status. As the economic crisis deepens, a singular reaction is appearing in many countries: alongside the fear, bravado and growing despair is a new understanding of the reasons for the crash -- the greed and competitive spirit at the centre of our systems and, therefore, the need for sharing. Of themselves, many are awakening to this basic truth and see sharing as the answer to injustice and war. Thus are many ready for Maitreya’s Call. This realization will grow as the crisis bites deeper and deeper into the shaky fabric of the outworn forms and structures that no longer work, can never be made to work for long. When Maitreya speaks, He will show that this is so, that the world is ready for the adoption of new and better forms, based on the true needs of the peoples everywhere. His is the task to focus and strengthen this growing realization of the oneness and unity of men, of their mutual dependence and awakening divinity. Thus will Maitreya and humanity work together for the restoration of this world. Since early January 2009 sightings of the star have been reported from Norway, South Africa, Canada, the United States, Dubai and Qatar. More and more sightings are now expected. Reports have already appeared in Norwegian newspapers. The article below by Benjamin Creme’s Master, who is based in the Himalayas, reveals how close we are to witnessing this sign and the historic events which will follow. Maitreya’s first interview will lead to further and more frequent interviews in the USA, Japan and other countries. In the very near future, people everywhere will have the opportunity to witness an extraordinary and significant sign, the like of which has been manifested only once before, at the birth of Jesus. Then, according to Christian teaching, a star appeared in the heavens and led three wise men from the East to the birthplace of Jesus. Soon, once again, a star-like luminary of brilliant power will be seen around the world. What does this mean? How is it possible? The answer lies in the fact that this mysterious event is a sign, and heralds the beginning of Maitreya’s open mission. Soon after the sign appears in our skies, Maitreya will give His first media interview on American television. On that open, public occasion, still unannounced as Maitreya, the World Teacher will present His views on the economic and financial chaos which now grips the world. He will explain its origins and final outcome, and present, to some extent, His recipe for amelioration of the present heavy burden on the poor of the world. Thus He will prepare the way for a more detailed and specific announcement of His ideas. How will viewers respond? They will not know His background or status. Will they listen to and consider His words? It is too soon to know exactly but the following may be said: never before will they have seen or heard Maitreya speak. Nor, while listening, will they have experienced His unique energy, heart to heart. Also, this is a unique time in history with whole nations stunned and apprehensive for the future. Therefore it can be assumed that many who hear His words will be open and eager to hear more. It is not for nothing that Maitreya has waited patiently for this moment to enter the public world; America, for one, would not have responded sooner. Now, for the first time in many years, a new Administration has to cope with financial chaos, unemployment and social unrest on a massive scale. The moment of truth for America and the world has arrived. Not alone in America but worldwide, people are awakening to the need for and the possibility of change. The politicians and economists call the present situation a ‘downturn’ and a‘recession’. In truth, we are witnessing the last stumbling steps of the old order. Millions are becoming aware that unbridled competition and greed are not the safest path for men, that such materialistic doctrines create a ‘slippery slope’ for the unwary, and, eventually, the international crisis we have today. Of course, many people of burgeoning wealth stand clear of the present loss of confidence in the ways which have made them rich, and think it only ‘a matter of time’ until we are back on course and thriving again. his name, well-known in esoteric circles, is not yet being revealed for various reasons. His monthly articles to him since 1982. The following is an excerpt from the April 2009 issue of Share International magazine. Q. How imminent is Maitreya’s appearance in the world? Q. Will most people feel their own soul on Declaration Day when Maitreya is speaking? A. Most people will experience their own souls, even if it is the first time in their lives. It will be an extraordinary experience for humanity. They will feel like a child; pure, listening from the heart to these wonderful words and experiencing a quality of life that they have forgotten – that goes way back to their childhood when they were simple, trusting, full of love and happiness. Q. (1) It was stated in Share International News Release No.88 that in the very near future a large, bright star, “a star-like luminary of brilliant power”, will appear in the sky visible throughout the world, night and day. “Around a week later Maitreya will give his first interview on major US television.” I find this statement somewhat puzzling because the star has now been appearing around the world for over two months. (1) Does this mean that Maitreya already gave his first interview around a week after the star first began appearing around the world? (2) Or does it mean Maitreya will give his first interview around a week after the appearances of the star have reached their peak and been seen by enough people? A. (1) No. (2) Yes, precisely. It would be of little use to mount this huge project (which it is) if humanity had no time to evaluate and respond. Q. Will sightings of the star eventually become numerous enough that it becomes a top headline in the news worldwide and publicly investigated by scientists? A. I do not know what level of response is required but it is obvious that some public recognition is essential. Q. First off, I have to say thank you for making this information available. I'm truly grateful. I'm writing because I think that I saw the miracle star your Master has described. It was Saturday night and I was working late. The location was Toluca Lake, California, USA. After I left the office to go to my car I saw a star that was brighter than any other that I've seen. It had an orb shape around it. While I was driving home on the freeway I was following it with my eyes. It seemed to change its position. Sometimes it was to the left of me and sometimes it was to the right. Maybe this is because the freeway changed position; I don't know. It did seem to shift to rather dramatic variables in distance. It seemed to vanish as soon as I got off the freeway near my neighborhood. My father thought that it might be Venus. It was exceptionally bright. Whatever the case may be, that was the brightest heavenly body I've noticed to date. A. My Master has confirmed that it was indeed the Star that you followed along the freeway. It does move about which, of course, Venus does not except slowly along its own trajectory. Venus is very bright and is often confused for the Star but Venus is becoming lower and lower on the horizon and, by 28 March or so, will no longer be visible to us. The Star is even brighter than Venus, and changes position and colour. Q. In late February 2009, I was in a city in the Brazilian state of Minas Gerais. There, I saw a really bright star in the sky. It was bigger than the other stars. It was a little similar to Venus, but the colour was completely different. Venus normally is blue and the star was yellow or golden. Was that the star of Maitreya? A. Yes, it was the Star. Q. A thought about the appearance of the star occurred to me: the first news release regarding the star starts: “Look now for the biggest miracle of all....” It sounds to me that we are told to regularly look for it, of course on evenings when there are few clouds in the west (in the case of New Zealand), and by looking for it we are inviting its appearance. And the more who look the stronger the invitation. Would this be correct? A. No, it is not really like that. The Star exists whether we look for it or not but if people do not look for it they will not necessarily see it and report it. It is necessary that it receives open public attention as a miracle – a sign of Maitreya’s appearance on US television. If it does not receive public attention of a certain amount it will not have served its purpose. Q. On the evening of 3 March 2009, for at least 30 minutes before the clouds came, I saw a bright star-like object on the western sky in Belgium. Could this have been the star? Q. I have been intrigued by your workings for some time now and I am really glad that I joined my local Transmission Meditation group before Christmas, it has given me a new lease of life and a new outlook on it also since I had been going through hard times before I joined. The one question I have, though, is how could I possibly help more financially, whether it be for the upkeep of the Share International website or to spread the word more to the world. I have never been charged for going to my weekly meditation and I would love it if you could point me in the right way to give a small donation of what I have in my position. I look forward to hearing your reply. A. I suggest that you offer a donation to your local Transmission Meditation group. If they meet regularly in a hired hall or if they are engaged in making known information about Maitreya’s emergence then they will need money for such work. I am sure they will be glad to accept it. We are lurching from one catastrophe to another because we do not know how to live. We do not know how to live in peace. We do not know why we are here. We do not know what is the meaning and purpose of life on Earth. We don’t know even who we are. We know almost nothing about the realities of life. We know how to send a rocket to Mars or the moon or whatever, but we don’t know the purpose of life. So without help we are doomed to destruction. Humanity is so empty of information, so casual about the nature of life, that it fails to make itself acquainted with the facts of our living, the facts of the nature of life even on planet Earth. Information that has been available in shops and books since 1875. Information about the nature of the spiritual level of humanity. We don’t even know the nature of our own being. We have a threefold being and we take as reality only the lowest aspect of that threefold being. We look in the mirror and take what we see to be ourselves. We think that is us, but that is only a reflection of the lowest aspect of us. The least important aspect – it’s important if you are living a life on planet Earth. If you’re dead on planet Earth then you don’t have one of those things that will reflect in the mirror. But without that body, are you less a being? No. What incarnates and shows as a reflection in a mirror is a great, divine, spiritual Being which we have many names for, but most people call it the soul. And that soul incarnates in a physical body over and over and over again, sometimes as a man, sometimes as a woman, on and on. And all the time progressing on planet Earth to a point where it no longer needs a physical body. What we call planet Earth is ensouled by a great Being, a great cosmic entity Whose work it is to create a planet, to visualize everything that will be on that planet and to bring it into being. And to do that in relation to the ideas, the thoughtforms, the creations in the mind of the greater Being Who ensouls the solar system. If you think of God in those terms it becomes clear that there is nothing in the whole of the manifested universe but God – that is all there is. And each one of us is a manifestation of a fragment of that greater whole which we call God. That divine aspect, the Self with a capital ‘S’, reflects itself at a somewhat lower vibration as the individual soul. That individual soul reflects itself at a yet lower vibration as the human personality. That is the reality. Why is it not talked about in schools? Why is it that nobody knows this? If we knew this, could we live life as it is on Earth today? Could we in the West be so greedy and selfish and allow millions of people to die for want of the food which is overflowing on Earth? No, we couldn’t do it if we knew who we were. We are God – literally God. Not in total consciousness of course, but potentially everything in the universe is in us. We live in a spiritual universe, that’s how it is. We cannot do anything about it. What we have to do is to make it manifest. On the night of 25 December 2008 my wife and I saw, in Enzersdorf near Hollabrunn in Austria, a large bright star in the sky, near Venus, but larger and brighter. My wife and I said together: “This is the Christmas miracle.” We can still see this star every night: my sister and family live in this village and also see it every night. Is this the star which announces Maitreya? I heard his voice inside my head. His eyes radiated energetic light and love. A moment later he suddenly disappeared. I felt real love in my heart! Was the man Jesus or Maitreya? On 15 February 2009, a handprint appeared on the window of my parents’ bathroom. I asked them about it and they said they had not made it. Was this a sign from Maitreya? If so, it’s the second handprint made this month. What is its purpose? I’m feeling a little tired and depressed these days, is it related to that? On 23 February at noon, the day after Benjamin Creme’s lecture and Transmission Meditation weekend in Barcelona, my husband and I were driving home. We cut through several crowded streets in one go because most traffic lights were green. At one point I saw that the green disc was not round in shape, but it clearly had the form of a big, green and luminous heart! It was a surprising view, and the only heart-traffic light I saw – the rest were all round, plain and normal. What was the source of this lovely traffic-light? I was cutting back plants in my front garden in October 2008 and heard a noise – pling, pling, pling, pling – and looked up to see a young man cycling past, looking from left to right, as if in wonder at the beauty of it all, smiling and ringing his bell. It struck me that it was so seldom that I see people passing with such a smile and happy demeanour. I saw him quite a few times more from my house – indeed I had been looking out for him – he made me smile! A few weeks later I was saying goodbye to my sister by her car and saw the man walking towards us on the footpath, carrying a plastic bag. As he approached, he looked straight at me, hunched his shoulders up to his ears with the biggest grin and a look of an excited, expectant child with a secret, full of happiness and joy. I called after him and said: “You’re so happy,” but he carried on walking. The next time I saw him was from an upstairs window. He was on his bike, looking quite normal as he passed by – then I noticed he was greeting and waving to all the oncoming traffic! Each time I have seen him I have been filled with joy and call him ‘Mr Joyful’. He was tall, slim, with long curly brown hair under his woolly hat, had a long nose and looked Middle Eastern, with olive skin. I have read that Maitreya is known as the ‘Happy One’ – was it Him? M.M., Kings Langley, Herts, England, UK. (1) It was I think, in 2006. I entered the tube station at Oxford Circus, London. On descending the first escalator I heard harmonica music coming from the middle landing. The music was upbeat and being played exceptionally well. It was very moving. As I approached the landing I was already thinking that here was something unusual. I saw a tall black man and it seemed as I watched him play that there was no filter between his essence and his music which was like a river of beautiful sound. It was clear that I was not the only one so impressed as at his feet there was a high pile of coins. I added mine and hazarded a glance at his face which was buried in the harmonica with eyes more or less closed. As I did so I thought: “I think you are not who you seem to be”. I carried on down the next escalator. About half way down I was hit by a wave of love so strong that I was virtually in tears by the time I reached the bottom. I can recall that sense of love and joy to this day. (2) On Monday 1 December 2008 I decided I needed to go out shopping. It seemed to have taken me an age to get out of the house with the right kit, receipts, wallet, phone, etc, and I was not in a good mood. It was almost dark. I rounded the corner near my house where there is little street lighting and passed someone but did not look at them. I was very much in the bubble of my own thoughts – when they said something like ‘excuse me’. It was an odd voice and I chose to ignore it. I do often respond to people in the street, but that evening I was not in the mood. Then I heard again ‘excuse me’ much clearer and also ‘with respect’ repeated twice and very forcefully. I immediately apologised with some excuse about not hearing properly. I then noticed this was a man who had both fists clenched and one was held up for me as if for an American-style fist-to-fist style greeting, or for me to shake as if it were a handshake with someone who was crippled and unable to open their hands. Still feeling tetchy and unsure what I was supposed to do, I did nothing and the fist went down again. In the very dull light I tried to get a better look at the man. I was aware of the eyes which seemed to look right into me but everything else seemed dislocated. The rest of the face and the limbs didn’t seem to join up in the right way. I was asked for 38p. Fumbling in my pocket I was beginning to wonder if this was a Master in a ‘familiar’ guise. As I was getting out my cash I dropped some and complained that I could not see what coins I had. I was looking for £1 to give him but regretted later not just giving the lot. Despite the conflicting emotions of annoyance and wishing to present myself in a good way should it be a Master (as if one could! ), in fact I was beginning to warm to this strange stranger and in any case to feel for him for what seemed to be awful disabilities. I gave my pound and said that I thought that should help him out seeing as he had asked so specifically for 38p. Then he said, ‘I am not a beggar you know’. So I agreed and in doing so I became very much more unsure that this meeting was what it appeared to be. Then he beamed and held up his fist again which I shook willingly as if a handshake. He hobbled off into the darkness. I was left with a profound feeling of lightness yet tinged with the regret that I had not been more friendly to begin with. I have been over this meeting so many times since then, such did it impress me. I can see many potential messages, that I should let go, not be so stressed, indeed, not be tight-fisted. Here was someone who appeared to be obliged to be contorted in body and yet who had an openness and freedom of spirit I could not really describe. As I go over this in my mind, even now, a light and wonderful energy seems to fill me right to my finger-tips. On 7 September 2008 I noticed smeared fingerprints on my bedroom wardrobe mirror. Since to my knowledge, no-one else has been into my room and the fingerprints are not mine, I was wondering: is this something to do with Maitreya? I was at the beach on Sunday 28 September 2008, around 9pm, handing out flyers for the monthly talks on the Emergence in Barcelona. One of the first people who came by was a young Indian or Pakistani man, very boyish and happy, who, as he walked up to me said in English: “Now you must explain this to me!” enthusiastically. I said: “Oh, you speak English!” and pulled one of the English Emergence newsletters out of my bag to give him. I was really focussed on wanting to hand out as many of these flyers as possible, and somehow didn’t think of talking to him at length. Instead I gave him the newsletter, and showed him where the website is indicated. He said he would read it later that evening at home, and then for some reason, perhaps because of his infectious smile, I asked him: “Where are you from?” He laughed, and pointing to his face, answered: “Can’t you tell? I am from India.” I was laughing too, but couldn’t help replying that actually people from many parts of the world have his skin tone. He was so alive and happy! Then it seemed like it was time for him to go, so he began to walk away, and as he passed by me, he said very clearly: “You are doing a great job!” It was only when he said that, that the thought flashed through my mind that he might be Maitreya. I felt a huge joy radiating from him to me, a feeling of endless happiness. Was this young man Maitreya? As of Feb. 1, 2009, reports of sightings of the star have begun to arrive from around the world. For the latest news and photos please visit our special web page here. Benjamin Creme answers questions concerning the relationship between international insecurity and market forces. Monte Leach: As Share International magazine points out, there are about 1,000 million people throughout the developing world living in absolute poverty. In the developed world, economic recession is pervasive. What are we doing wrong? In your view, what's the problem? Benjamin Creme: The major problem is the fact that we have come to the end of our civilization. We are witnessing the breakup of the civilization of the last 2,000-odd years and the beginnings of the process of creating a new civilization. This is why Maitreya is in the world: to inspire and guide us, to educate us in the creation of the correct structures — political, economic, and social — which will allow us to go forward in our evolution on the right premises. At the moment we see a super-division of the world, a separation into major groups — the developed and the developing world. The developed world usurps and wastes three-quarters of the world's food and 83 per cent of the resources. The Third World, as it is called, has to make do with the rest. As a result, 38 million* people are, at this moment, starving to death in a world with a huge surplus of food. We have a 10 per cent per capita surplus of food in the world, so no one need starve. What is required is a reassessment of who and what we are in our relationship to each other. Maitreya says the first step we have to take to address these problems is to see ourselves as one, brothers and sisters of one humanity. We have to get that sense of globality, that we are one people, one group and therefore the food, raw materials, energy, scientific know-how and educational facilities of the world belong to everyone. These resources are given so that all people may evolve correctly according to the Plan which underlies our evolutionary process. As a result, we must share these resources more equitably. When we share, Maitreya says, we will create justice in the world, and when we create justice, and only then, will we have peace. He has come to show us how to have peace. If we do not accept the process towards peace, there will be no world, because we can now destroy all life on this planet many times over. We have the nuclear arsenal to do this. ML: The major threat, as you see it, to international security is not nuclear arms per se, but the tension which underlies the economic situation. BC: According to Maitreya, what he calls the “engines of war” have been switched off. The Cold War is over. No one any longer believes that the US and Russia are going to destroy each other in a nuclear holocaust. But the energy which sent the planes into the sky and the tanks and troops into the battlefield does not just disappear. It is a destructive force which he says has been going around the world looking for a new home. He says it has found a “new womb”. That “new womb” is commercialization based on market forces, which, he says, are based on human greed. Maitreya calls market forces the “forces of evil” because they have inequality built into their very structure. They help a few to achieve a better standard of living, but at the expense of millions who suffer a lower one. Commercialization is gripping every nation in the world as the market forces concept begins to dominate even in the previously communist bloc. We are finding a situation where the rise in tension is so great it has within it the seeds of a third world war, and that war would destroy all life. BC: The communist system did not fail. It was never tried. We never saw communism in the so-called communist bloc. What we saw was a kind of state capitalism. What we are seeing now is a break-up of the totalitarian political system — which is not the same thing as communism — and the gradual transformation of capitalism. Maitreya says the symbol for the new economic situation, which will be neither capitalism nor communism, can be witnessed in the coming together of communist East Germany and capitalist West Germany. The reunification of Germany gives us the possibility for the creation of what he calls a social democracy or a democratic socialism — something which is neither classical capitalism nor communism. He says eventually this will be the norm in Europe and throughout the world. ML: How does that relate to what you were talking about in terms of sharing? BC: Unless we share the resources rather than compete for them, we cannot create that new situation. We have enough food and resources in the world for the needs of all people, but the major nations — the US, the European states, Japan and one or two others — completely dominate the scene and usurp and misuse most of these resources. So there is not enough for others at a price that they can afford to pay. The Third World is strapped for its very existence. That is why there are 38 million* people starving there. If we had a drought in California, Florida, Britain or France, for example, we would be able to buy food grown elsewhere. The reason why millions die is not from drought but because they do not have the finances to replenish that which is lost through drought. If you have an economic system which is not based on competition, greed and self- service, which is what market forces are about, then you can redress this whole situation. Maitreya says that any government which follows market forces blindly is leading its nation to destruction. He says this civilization is literally at the end of its tether. It is coming to a halt. What we are witnessing today is not simply a recession or slowdown of production. We are witnessing the death throes of the current civilization because it is based on wrong premises. Market forces assume that everyone starts at the same point. But everyone does not start at the same point. No two nations start at the same point. No two individuals within those nations start at the same point. There are extraordinary discrepancies in living standards. How many people imagine that the world can go on indefinitely in this hideous situation? For how long do people imagine that the people of the Third World will put up with this state of affairs? The answer is sharing, a sharing of resources. ML: In other words, the current system will collapse. BC: Maitreya says we are witnessing its collapse. He says it is inevitable, and that there will be a world stock market crash which will begin in Japan. Maitreya said this in 1988, and since then the stock market of Japan has lost nearly 60 per cent of its value. Maitreya says it is a bubble; it will burst inevitably. How it bursts depends on ourselves, but it has to burst and let out all the corruption and inequality which prevents the demonstration, as he would say, of the true inner spiritual nature of humanity. We are wasting the resources of countless millions in the world by condemning them to an enforced poverty and degradation, and the misery of undernourishment and starvation. ML: You are saying it will literally take a collapse for the changes that you are recommending to be made, and nothing short of that will be enough. Perhaps we can see the error of our ways. BC: Many people see the error of our ways. I am not alone in pointing this out. But governments, and people who keep the governments in power — enormous vested interests in the world in all sectors, the simple greed, the self-protective mechanism of humanity — all prevent these changes from taking place. Almost everybody would admit these changes would be useful, but maybe impractical to implement. Maitreya says if they do not take place, we will destroy ourselves. He says that it will take the collapse of our economic system, as we have known it, to bring us to a sense of reality, to realize that we cannot go on indefinitely in a world where one-third of the population uses three-quarters of the world's food and 83 per cent of the other resources. The crime, drug addiction and social unrest in the developed world are a direct result of this imbalance in the world's resources. Even the distortion of the world's long-established weather patterns is the direct result of this disequilibrium created by man's disharmonic thought patterns. ML: When do you see this collapse occurring? BC: Maitreya has said it will be very soon. Obviously, we see what is happening in Japan. In 1989 the stock exchange stood at 38,000 to 39,000. Today it is around 16,000. It will go up a little bit and then down a lot, and then go up another little bit and down again, but heading down overall, until even the Japanese government can no longer keep the financiers in check. They will start jumping out of high windows like we would be doing here if the same situation were pertaining. ML: What happens after that? BC: Maitreya says when that happens the priorities of all governments will change. He says the number one priority of all governments will become the provision of correct, adequate food for all the people. It is the number one necessity. Second will be the provision of adequate shelter for all the people; third, the provision of adequate health care; and fourth, educational facilities for all the people. These are the basics which do not seem too much to ask for enough food, shelter, health care, and education. Yet there is no country in the world not even the US, the most powerful militarily, and once the richest, country in the world not anywhere do these four requirements pertain as a universal right. He says that when they do, they will transform the world. Humanity is going through a great spiritual crisis, Maitreya says. It is a crisis of identity, to find out who we really are as spiritual beings. As souls we are one. There is no such thing as a separate soul. On the physical plane we have the illusion that we are separate, but in fact we are one. Therefore, we can make this step forward in our evolutionary advance only when we create right human relationships. That is the next spiritual ideal to be achieved by humanity. The first step is the sharing of the world's resources, because if we do not do this we will destroy ourselves. It is as simple as that. We have free will. Maitreya is not going to interfere and make sure that we do not destroy ourselves. He is going to present us with these alternatives: carry on as we are today in the old, greedy, selfish, competitive ways of the past and destroy ourselves, or else accept that we are one, accept the Principle of Sharing; implement it, create justice in the world, and therefore peace, and begin the construction — under his inspiration, of a most brilliant and wonderful civilization such as this world has never known. ML: How will it work exactly? Will the changes occur on a national basis? For instance, in the US, will we say: “We need to change our priorities?” Or will it happen internationally through the UN or some other forum? BC: I would suggest it is a combination of both. The UN will become the major debating chamber of the world. All world problems will be debated there and resolutions passed which will implement the new system. An entirely new UN agency will be set up specifically to oversee the process of sharing the world's resources. But I must emphasize that we have free will; nothing will be forced on humanity. When humanity — of its own free will — accepts the Principle of Sharing and asks Maitreya and his group of Masters, who are likewise returning to the world (there are already 14 Masters in the world), how do we do this, how do we set about sharing, then we will find that the plan is already there. There is a group of high initiates who have worked out with the Masters over many years a whole series of interrelated plans which will solve the redistribution problems which today are at the heart of the economic problems. It is really a problem of redistribution of resources. That redistribution results from a change of consciousness. Humanity is approaching a point where it is undergoing a great shift in consciousness, beginning to recognize itself in relation to each other and to cosmos, to nature, to what we generally call God, in an entirely new way. Maitreya says that everything, every single thing in cosmos, is interconnected. There is no break at any point. What we do to ourselves, we do to nature. What we do to nature, we are doing to ourselves, as God, because we are reflections, points of consciousness of that total consciousness that we call God. Throughout the whole of cosmos this process is enacted and re-enacted; every thought, every action is setting into motion a cause. The effects stemming from these causes make our lives. If we have an underground nuclear explosion, for example, we will certainly have an earthquake. Every effect streams from a cause. Maitreya will emphasize — and we ought to know it by now, we have had thousands of years to understand it — that everything in life obeys the Law of Cause and Effect. We cannot go on creating wrong conditions and expect there will be no effects. If we create conditions of imbalance in a nation, inevitably we get crime. Just making a stronger police force or army will not solve the problem. We have to combat the source of the crime — inequality, imbalance. The whole process of evolution is moving towards oneness, fusion, synthesis. Market forces, which are based on division, separation and competition, act against the evolutionary process. That is why Maitreya calls them “the forces of evil”. They have their place, but only a very limited place. When they are followed blindly, they lead inevitably to destruction. ML: Will Maitreya be openly advising humanity? Right now I think it would be fair to say that very few people know about his presence in the world. BC: Maitreya will be openly advising. He will come forward as the World Teacher for all groups, religious and non-religious alike. He will be looked towards by religious groups as their expected Teacher: the Christ for Christians, Maitreya Buddha for Buddhists, the Messiah of the Jews and the Moslems, Krishna for the Hindus. But in fact, he is really a teacher, an educator for the whole of humanity, showing us how to become what we are, spiritual beings, and therefore how to create the environment in which that spirituality can be expressed. It cannot be expressed in the midst of these divisions and separations, this competition based on market forces. ML: If I am a farmer in the US, for instance, if I am growing food and I put a lot of hard labour into it, should I not reap the benefits of doing that work? Sharing sounds great, but will we actually implement it when the time comes? BC: According to Maitreya, we shall. He knows already that humanity is ready for sharing and will accept the principle of sharing. That is why he can be here. Of course, the farmer in the US producing food should reap the benefit of his labour, but the poor peasant in Zaire or Zambia should also reap the benefit of his hard labour. That does not pertain today. In the developed world, we produce so much that we dominate the world's markets. We lay down the price of our goods and, because of our resources, the price of the goods of the Third World also. We demand from the Third World countries the raw materials and products at a price which leaves them able to live only at a very low level, with 1,000 million people living below the poverty line and 38 million* actually starving. Yet we demand for our resources, for our production, the top value that we can demand on the world market so that we can maintain what is a very artificial level of living. People in the US, Europe and Japan live on the backs of the Third World. This is the reality. The reason that we do not see it is simply our complacency. Maitreya calls complacency “the source of all evil”. ML: Yet many people here in the US would say we are not complacent. When there is a crisis in Africa or elsewhere, we are right there responding with food and aid. BC: Of course, but these are individual reactions. In every country you will find those whose hearts respond to human need. But it is an on- again, off-again affair. Humanity as a whole, through its agencies, the governments of the world, does not address these problems on a global scale. We would not put into power, perhaps, a government whose number one priority was the saving of the starving millions if it meant the reduction of the living standards of our own nation. Nobody can win votes on that basis, or so the politicians think. The time is coming when they will not win any votes at all unless they put that issue at the forefront of their priorities. What we are going to witness is the creation, by Maitreya, of a world public opinion focused, galvanized, centred on sharing as a divine right. Maitreya says: “When you share, you recognize God in your brother.” He says the problems of mankind are real, but solvable. The solution lies within our grasp. He says: “Take your brother's need as the measure for your action and solve the problems of the world. There is no other course.” He will galvanize and potentize world public opinion which, when so organized, no government on earth can withstand. It is that world public opinion which eventually will force all the governments in the world to accept the principle of sharing because it will be seen that we have no alternative. We either share or we die. It is as simple as that. ML: The power, in essence, will be from the people, and not from any teacher like Maitreya. BC: Exactly. Maitreya comes with the power of inspiration and guidance, but not with autocratic power. He says that from now on governments everywhere will be by the people, for the people. We are already witnessing it. Look at what has happened in the former Soviet Union. It is chaos at the moment, but who brought down the Berlin Wall? Who opened up the Soviet Union to glasnost? Mr. Gorbachev was mainly responsible for ending the Cold War and for glasnost in the Soviet Union. Of all the world leaders, he is the one most responsive to the mental impress of the Lord Maitreya. We are witnessing the galvanizing of humanity, the people of the world, to take upon themselves responsibility for their own lives. Over the last few years, that has been happening all over the world. The dictatorships of the world are going. That is why the Soviet Union broke up — not from the collapse of communism, but from the collapse of political totalitarianism, which is something else. We are also seeing the collapse of economic totalitarianism. The economic system, largely based on market forces, is approaching its death. There is a third totalitarianism yet to break up: religious totalitarianism. Religious totalitarianism is reaching the acme of its power. We see that in the rise of fundamentalist groups in all religions, even in the tolerant Buddhist and Hindu faiths. It is expressed in Islam very powerfully today and in Christianity too. It will be the last to disappear, but eventually totalitarianism in the churches will go. Then humanity will know freedom for the first time: political freedom, economic freedom and justice, and freedom of thought and belief. From the July 1993 issue of Share International. Benjamin Creme is the British chief editor of Share International magazine, an artist and an esotericist for many years. His telepathic contact with a Master of Wisdom allows him to receive up-to-date information on the Maitreya, the World Teacher’s emergence and to expand on the Ageless Wisdom Teachings. For a selection of more questions and answers about the need for sharing click here. 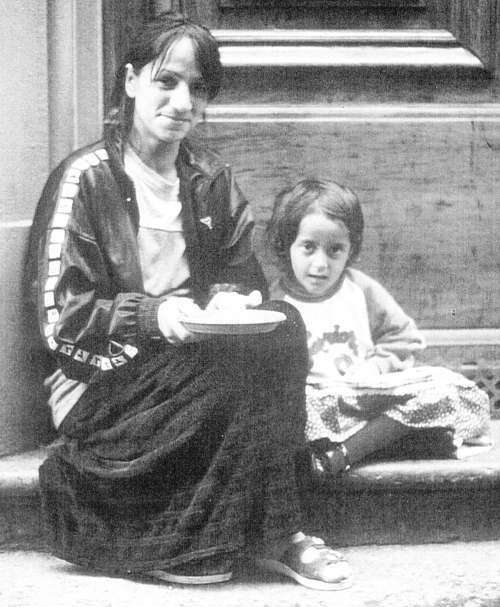 Benjamin Creme’s Master confirmed in Share International magazine, June 2001, that this is a photo of Maitreya Who has assumed the guise of a young woman begging; the ‘little girl’ is in fact the Master Jesus, Who works closely with Maitreya. 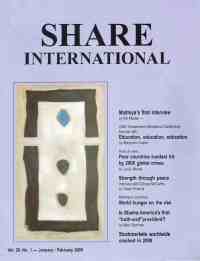 For a selection of more photos from Share International magazine click here. He has been expected for generations by all of the major religions. Christians know him as the Christ, and expect his imminent return. Jews await him as the Messiah; Hindus look for the coming of Krishna; Buddhists expect him as Maitreya Buddha; and Muslims anticipate the Imam Mahdi or Messiah. Although the names are different, many believe that they all refer to the same individual: the World Teacher, whose personal name is Maitreya (pronounced my-tray-ah). Preferring to be known simply as the Teacher, Maitreya has not come as a religious leader, or to found a new religion, but as a teacher and guide for people of every religion and those of no religion. At this time of great political, economic and social crisis Maitreya will inspire humanity to see itself as one family, and create a civilization based on sharing, economic and social justice, and global co-operation. He will launch a call to action to save the millions of people who starve to death every year in a world of plenty. Among Maitreya's recommendations will be a shift in social priorities so that adequate food, housing, education, and medical care become universal rights. Under Maitreya's inspiration, humanity itself will make the required changes and create a saner and more just world for all. For more detailed information on Maitreya’s emergence click here.